Our AC unit went out the other day and we had to spend two, yes two, full days without air conditioning! *GASP* One of those days was a highly unusual mid-week day off. So, I was home in that mess and it was as hot as balls up in here! I decided that I needed to make some lemondade. I mean, that’s what people drink when they’re hot, right? It wasn’t going to be any special lemonade. Well, it’s my Gramma’s recipe so, that makes it special, but it was just going to be regular, lemon flavored lemonade. Until… I wen’t to the cupboard for the sugar and a lovely pink bottle caught me by the corner of my eye. The Rosewater. Oh my f’ing G! Of course! I suddenly forgot about the insane heat and became awash with excitement! I know, that’s totally food nerdy of me but, there’s a feeling that you get when you KNOW something is going to be right. This was one of those moments. 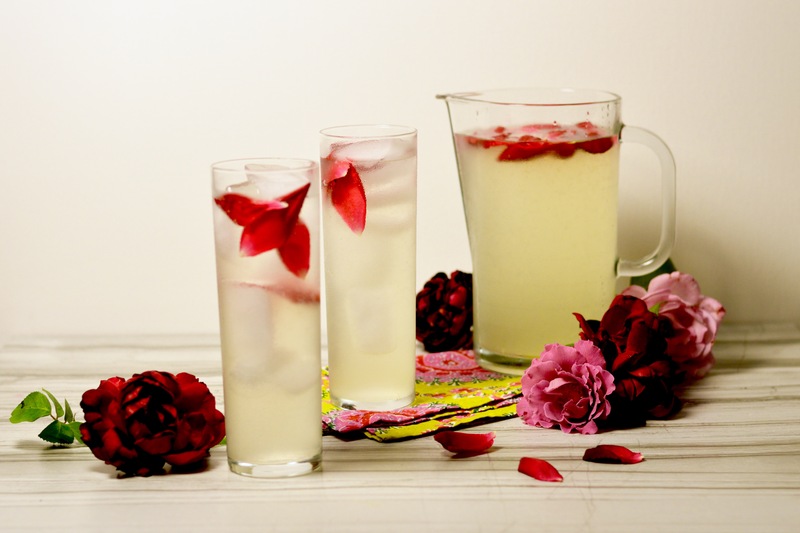 rose petals for garnish *please only use petals if you are certain that they have not been sprayed with pesticide. In a small saucepan, heat sugar and 1 cup of water over medium high heat. Bring to a boil and let simmer for a few minutes. Remove from heat, cover and place in fridge to cool. Once the simple syrup has cooled, add it and the lemon juice to a large pitcher and stir. Pour in about 7 cups water and the Rosewater, and some petals for color. Mix and chill. Why does this warrant a TGIF post? I thought you’d never ask! Pour it over ice and mix in a shot or two of vodka for the most elegant tasting hard lemonade you’ve ever allowed to pass your lips! Perfect for a gathering like a bridal or baby shower, you can even add it to a dry champagne to up the ante! I know Rosewater sounds like some crazy exotic (and expensive) ingredient, but I swear it’s not. I got mine at Whole Foods for $5.99 and it can be purchased here similarly priced. I used two teency weency tea spoons for an entire pitcher of lemonade. Add a few drops to a vodka soda to elevate your beverage from whatever to WOW! Add tea spoon to your next vanilla frosting, a bit into a batch of shortbread… Who knows? The possibilities! This is it! Easy peasy lemon squeazy! See what I did there? This beverage is fantastic on it’s own. Seriously. Too good for the kids and their mac n’ cheese, chicken nugget pallets! This is special lemonade. TGIF! Swearing Mom out!